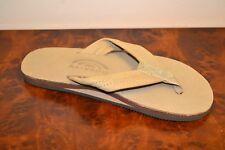 MEN'S *PRE-OWNED* RAINBOW SANDALS, SIZE LARGE 10-11, BROWN Oiled Leather. 4.0 out of 5 stars. (1) - Rainbow Sandals 302ALTS eXpresso Leather Double Layer Sandal Men's sizes S-XXXL! RAINBOW Sandals Leather Flip Flops Black Womens Size 9/10/11 Narrow Straps 11"